I have long thought that the organizers and corporate supporters of the 2018 Winter Olympics in Pyeongchang should invest more efforts in augmented reality applications to assist visitors from around the world in learning about various aspects of Korea including history, geography, industry, and culture. The recent worldwide media attention to the new Pokemon Go app that makes use of augmented reality caught my eye. However, I was quite surprised to read in The Guardian and in local papers, including The Korea Joongang Daily, about South Koreans flocking to Sokcho to play the game. 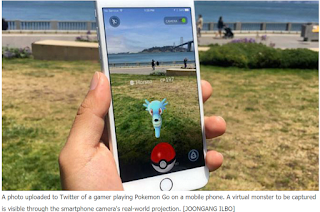 As noted in the latter article, "Pokemon Go’s GPS is based on Google Maps, but the Korean government has yet to provide detailed maps to the American company because of concerns over the release of sensitive information such as military base locations, since the South is still technically engaged in conflict with North Korea. Pokemon Go gaming communities in Korea, though, found early on Tuesday that the game worked in certain areas in Gangwon, including Yangyang County, Inje County and the city of Sokcho. Some gamers’ screenshots uploaded on Wednesday to popular domestic webzine Inven showed the game working on Ulleung Island, 120 kilometers (74.5 miles) east of the Korean Peninsula." (Click on the graphic for a full-size version) There is little question that augmented reality apps like Pokemon Go are going to be very popular around the world. The question in Korea is how legal restrictions currently in place might be adjusted to allow such apps to function fully here.